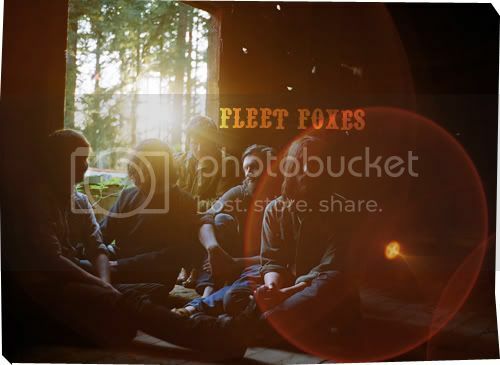 Listening to Seattle based quintet, Fleet Foxes, would often bring to mind of Americana folk music, which is indeed what the band superbly delivers in their songs. Heavily bearing pastoral, rustic themes as it effortlessly evokes images of wondrous landscapes; lush woods, crystalline streams, rushing rapids, soaring mountains, and complete with the cool mist of morning. Their eponymous debut, released earlier this month is a compilation of wistful, entrancing folk tunes, largely induced with a west coast 60s pop feel, and embellished with beautiful, transcendent vocal harmonies. The music is very pristine and mellow, saturated with a world-worn weariness, and tinged with a lullaby-esue quality, creating a listening experience that’s equivalent to a soporific, restful journey. 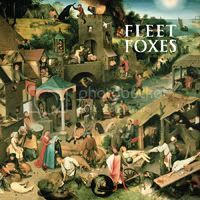 Empirically, this first full length by Fleet Foxes is a brilliant record, regardless of anyone’s opinion, or the fact that I find it too Americana or even the fact that it makes me feel older-- although do take note that the primary songwriter is only 21. This song on the other hand, is guaranteed to draw you into Fleet Foxes territory; I get that same effect when I first listening to it, even after numerous, repeated listens. ‘White Winter Hymnal’ is dreamy and delicate, containing one of the most beautiful and sweetest vocal harmony parts, that’s ever laid on your ears. Plus, if you haven’t listened to this song, than you might just be the only few ones left who still haven’t.